I’m currently sitting in a 12-passenger van with 11 people. We are snuggled (i.e., squished) together and jamming to Beyoncé. It’s truly beautiful. The people surrounding me we’re complete strangers to me less than a year ago. Now were great friends headed to North Carolina on an Alternative Spring Break trip. It boggles my mind. I grew up in a small town knowing the same people my whole life, so coming to MU has completely altered my perspective of relationships. The friends I’ve made here have become a family. So this week, rather than going home and seeing my real family, I’ll be spending all day, everyday with a bunch of amazing people my age that are willing to give up their spring breaks to help those less fortunate. I never expected this from my college experience. I never planned on meeting so many kind and caring human beings. I’ve never been so happy to be wrong. I’m not really sure what to expect from this trip. A lot of great experiences and hopefully the chance to share love and joy with the Headstart program of Franklin, NC. If you decide you want some updates, you can follow our Twitter handle @MAB_Franklin. 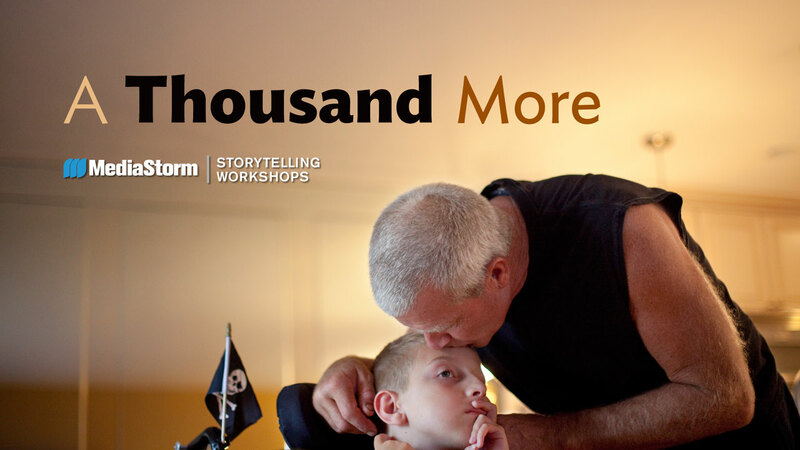 A Thousand More, a video produced by MediaStorm, demonstrates the beauty of a good visual story. The tale is about a young boy named Philly Mayer who was diagnosed with Spinal Muscular Atrophy (SMA). Due to the disease, his movement is hindered to the extent that he is confined to a motorized chair. However, that doesn’t stop this ambitious boy from doing the things he loves. He’s an avid swimmer and adventurer. Philly’s family shows an unparalleled love and support for this sweet little guy. Philly’s doctors told his parents that he would only live to be seven years old. When his mother asked the nurse what they could do for Philly, she replied, “Nothing.” SMA has no known cure, but is merely a disease to wait out. With such a disheartening diagnosis, Philly’s parents have taken the initiative to provide the fullest life possible for their son. “He’s going to do what he wants to do,” says dad, Phillip Mayer. Philly has traveled the country, been involved and shared his story. Despite the doctor’s prediction to last only seven years, Philly is still going strong. He is approaching his 12th birthday (April 2). Sadly, while doing a little research about Philly, I discovered his father died this past January. (I’ve been crying about for 10 minutes.) I’m not sure the cause, but I can’t begin to fathom what this loss has done to the Mayer family. However, the Mayer family has a strong, Christian faith and church family to help them through. The piece is truly phenomenal. It tells an emotional story that will tug at your heartstrings, but also provides hope. Philly is one heck of an inspirational kid. With all the struggles he’s had to overcome in his short 12 years, it’s amazing that he is able to be such a playful and optimistic person. Aside from the beautiful story told, MediaStorm did a great job putting it all together. With our video projects in J2150 just around the corner (i.e., due Tuesday and I haven’t started), this piece provides several ideas about how video is done. I hope that I can some day produce a piece of this magnitude and share awesome stories that inspire viewers to care about my subjects. I’ve discovered something terrible about myself. I’m addicted to social media. I understand that as a journalist, it is important for me to know what is going on in the world, but it’s not essential to be constantly checking my Twitterfeed for the latest headlines. My obsession finally reached new levels when I was holding a conversation with a friend and I realized that I was suddenly scrolling through Facebook, ignoring the person that was telling me about a personal issue in her life. I had to ask her to repeat herself and it made me feel like a disgusting human being. I didn’t have the decency to put my phone away for seven minutes and listen. This is not the Ellise I used to be. Not the Ellise that I want to be. I want be someone that can hold a conversation and be able to participate fully without rudely checking the latest Instagrams. Recently, Coca-Cola Middle East produced a tremendous video that we could a learn a lesson from, myself included. Though it humorously involved placing a dog cone on your head, it brings up an important topic of discussion. We, as people living in an age of technology so readily available to us, have grown accustomed to constant connection with the world. Now I’m not saying that being connected with the world is a bad thing. Honestly, it’s like magic. You can talk to people across the globe in a matter of seconds, like holy crap, you guys. That’s awesome. But at what point does it become excessive? It’s been four days since my revelation. I don’t regret my decision to slow down on social media one bit. I feel antsy at times, but it passes. (I sound like a recovering drug addict…) I’ve noticed increased attention in conversations, in class and in general. I’m more observant, but what I observe is a lot of people on their phones. I know it’s unrealistic to expect everyone to just drop their phones and delete their favorite apps, but I want to make you all aware of something that has silently consumed our lives. Maybe it’s time to reevaluate ourselves. How can we create relationships with those around us rather than worry about what your crush’s latest funny tweet? Another reason I decided it was time to delete the apps is because this past Wednesday began Lent. As a girl claiming a strong Christian faith, I wanted to give up something that I far too often put before God. Social media is at the top of that list. Why read the Bible when I could read another article on Twitter or read through another Facebook fight? Why pray when I could see what my NatGeo idols are posting on Instagram? It makes me sick that this is my mindset. I may not have actually consciously thought these things, but it’s in the back of my mind everyday. So I encourage you all to take a second to think about your own social media habits. I know not everyone is as bad as me, but we could all use a little help. And social media may not be your vice. It could very well be Flappy Birds or Dice with Buddies that causes your screen addiction. Whatever it is that takes you out of the present, focus on it a little less. Even if you only make a conscious effort a few days a week, that’s a few days that you will be able to relate to those around you better than you have in a while. Since 2004, one weekend every spring is dedicated to the True/False Film Festival. Thousands flock to Columbia, MO to watch the many films shown throughout downtown, enjoy live music and unique artwork, and partake in this rare event. This is my first True/False Film Fest that I have attended. Being new to CoMo my freshman year, I had no idea that the town would come to life with such vigor. I hid away in the safety of my room for the majority of the weekend. After the fest had ended, I heard of all the amazing stories told in the films, the great experiences my friends had and the variety of people to meet just a mile from my residence hall. I was appalled with myself. Why would I dare avoid such a great event? So this year, I decided that I was going to participate. I may be poor, but the goal is to watch at least three films. I saw my first film last evening. It was titled Captivated: The Trials of Pamela Smart. The film took us back to 1991 when 22-year-old Pamela Smart was convicted as an accomplice to first-degree murder and sentenced to a lifetime behind bars without chance of parole. Smart’s husband, Gregg Smart, had been shot in the head during, what appeared at the time, a burglary gone awry. However, three boys were later charged with the murder, one of which happened to be the 16-year-old lover of Pamela Smart. Smart had worked for the school district that the three boys attended and it was believed that she had paid each $1,000 to kill husband Gregg. Director Jeremiah Zagar takes viewers to the time of the trial, but provides many unique perspectives. Though the story is about the case of Pamela Smart, there is a large focus on the media storm. This trial was the nation’s first taste of reality television. The case was covered by news outlets from coast to coast.